In our experience with Volkswagen’s diesel engines, the best way to optimize fuel efficiency while exploiting an enthusiast engineered machine is to go with their six-speed manual transmissions. So when a four-door Golf diesel arrived at our office with the optional $1100 DSG six-speed automatic, we were, to say the least, a bit saddened. Diesels aren’t really known to appeal to an enthusiast buyer, that’s what the GTI is for. Sure we prefer to shift-for-ourselves, but in the case of Volkswagen’s infamous DSG transmissions, this one is just icing on the cake to a great car. Using 236lb-ft of torque at 1,750 rpms, this 150-horsepower hatch takes just under 8-seconds to 60 mph through its new 2.0-liter turbo diesel motor. The Golf TDI isn’t quick by any measure, and if opt for the manual it does takes a little longer to sixty – but that doesn’t stop it from being a little rascal – it merges with traffic effortlessly and the turbo kicks in when you need to pass big-rigs in the slow lane. But it’s just not the going nor the shifting that makes this Golf a great car – the chassis on this thing is the best in the business. There is a sense of solidness and well-roundedness as you drive around town. The suspension system holds a tight balance of comfort while providing the driver a dynamic feel for the road. There is always a sense of connectivity between the driver the car through the leather wrapped steering – it feels tight as a drum being precise and responsive to the drivers input. What makes this even better is that this Golf TDI is quiet – at idle it sounds like a gas engine. Outside the low revs and TDI badge on the tailgate you wouldn’t know this is diesel. Until you look at the fuel consumption, as we averaged 38 mpg around town and 460 miles of range. And that’s what diesel are known for – EPA rates this Golf TDI at 31/43/36 (city/highway/combined). 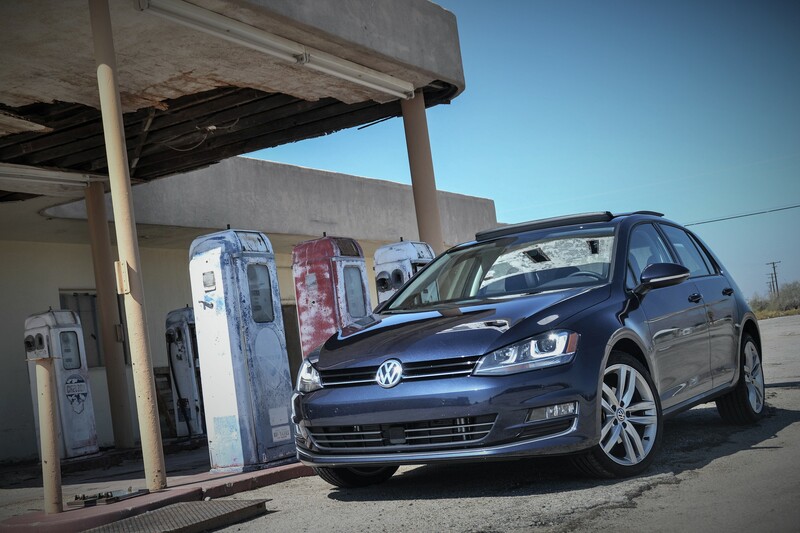 Outside, the Golf is a good-looking, handsome hatch. It’s sleek, clean, and no matter where it’s parked, it’ll always blend in. Our top spec’d SEL arrived wearing 18-inch shoes that made our testers Midnight Blue paint standout from the unoriginal silver and gray paint we tend to get. The $995 Lighting Package brighten things up by adding attractive LED daytime lights with Adaptive Bi-Xenon Headlamps. Working our way into the cabin, our testers Quartz Gray and Black interior is a nice break from the usual black leatherette. The front sport design seats are quite comfy and supportive for long distance hauls – the driver gets a multi-way power adjustable seat while the passenger gets to struggle through the old-fashion manual adjustments. For a small hatch there is enough room in the back for a large adult with accommodating leg and head room as well as decent thigh support. The vinyl seats featured here are a bit cheap with our tester nestled at 32-grand and as the summer temps start creeping in, they become more of an unpleasant experience. With the SEL starting at $29,495 it does come fairly well equipped with Heated Seats, Pano Sunroof, Navigation with Back-Up camera, Fender Audio System and Dual-Zone Climate Control. A step up from the last-gen Nav system, this 5.8-inch touch screen system is a little better – still requires a little work with useless voice control and a cartoonish Navigation that falls short of being a Garmin system, but is far more intuitive than before. Like the exterior, the interior of Golf is handsome. It carries a clean design and the trim work is top notch. Everything feels of high quality and solid construction. Having the urge to nit-pick, we’re not too big of fans of the glossy piano black center – not to say it doesn’t looks nice, because it does and with our tester sitting just about 2500 miles on clock it hasn’t had time to see wear n’ tear – but give a few more thousands miles and a few more journalist with kids and we suspect that will fill up quick with scratches and dust that will never go away. Adding in the $695 Driver Assistance Package which offers up front and rear parking sensors and frontal collision alert, our sampled Golf TDI sees an as-tested price of $32,005. Now that’s a big chunk of change from a small car – but at the same time we like to see a hybrid push 38 combined mpg and be as much fun to drive. Nice write-up and the pics are top tier! Worth the long (long, long, long!) drive to Desert Center! Diesels are so popular in some countries we get to see the byproduct of that demand in cars like the the TDI Golf MkVII…..long gone are the glow plugs. Prices of diesel in central coast Cali are often around or just above premium, but currently 80 cents or more less than a gallon of premium; such variability affects the buying decision but at the moment diesel seems even better than hybrid. This Golf has a urea tank I think….if yes, not a deal breaker, but annoying. I think they had to go with a torsion bar suspension at the back as well, but does seem to have hurt the handling. Hope they sell loads and consider bringing the GTD to the US! James: Nice review! Where is that gas station? They are delivering that car to me today to test for thetruthaboutcars.com. Which begs the question: when I get your hand-me-down test cars, are the brakes shot? Haha I don’t think you need to worry so much about my testing but so much as to where and who else has it been through this past month? The gas stations are based in California along I-10 in a town called Desert Center – its about a 5 hour drive (from Phoenix) to the abandoned town.